Seen in Vmware ESX / Vmware Vsphere environments with both ESX and ESXi hosts. As far as errors go this one’s pretty straight forward (and very common). I’ve seen it in ESX3 and VSphere networks, with high availability clusters. It’s complaining because there is only one physical NIC presented to the Service Console (I know ESXi does not have a service console, but it has a management IP). To fix the problem you can do any one of the following. 1. Ignore the error, HA will still work (though it’s simple to stop it giving an error). 2. Present another physical NIC to the virtual switch that has the Service Console/Management port. On a host with loads of NIC’s that easy, but if your pushed for NIC’s then that’s not an option. 3. The easiest, and my preferred option; You already have Vmotion running for HA, so simply add a Service Console (or a vmkernel management port if your running ESXi) to the vmotion switch, you will never need to connect to it anyway, and it will stop the system presenting this error. If you are on an ESX host skip to the next step, ESXi users only select use this port for management option. 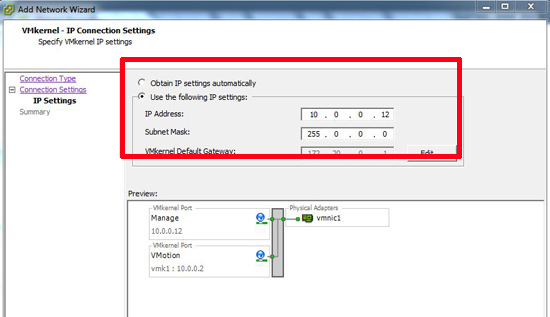 Take note of the IP address of your existing Vmotion kernel port. 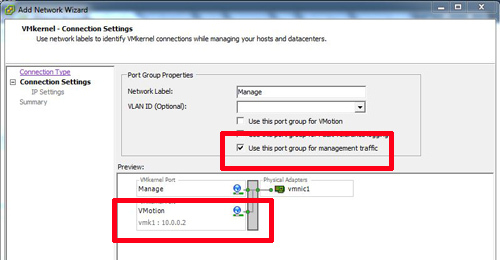 Give it an IP address in the same range as your Vmotion ports.